Mangalore, March 9, 2013: Southern Railway will run the following Special Trains to clear the extra rush of passengers during the summer months of April, May and June 2013. Advance reservation for the above trains will commence o­n 10.3.2013. 1) Chennai Central – Madgaon (Goa) - Chennai Central Weekly Specials: T.No.06001 Chennai Central – Madgaon Weekly Special will leave Chennai Central at 10.10 hrs. o­n Sundays from 5.5.2013 to 9.6.2013 and arrive Madgaon at 10.30 hrs. the next day. T.No.06002 Madgaon - Chennai Central Weekly Special will leave Madgaon at 13.15 hrs. o­n Mondays from 6.5.2013 to 10.6.2013 and arrive Chennai Central at 12.30 hrs. the next day. The trains will stop at Arakkonam, Katpadi, Gudiyattam, Ambur, Vaniyambadi, Jolarpettai, Salem, Erode, Tiruppur, Coimbatore, Palakkad, Shoranur, Kuttipuram, Tirur, Kozhikkode, Vadakara, Thalassery, Kannur, Payyanur, Kanhangad, Kasaragod, Mangalore, Suratkal, Udupi, Kundapur, Mookambika Road, Bhatkal, Murdeshwar, Kumta and Karwar. T.No.06002 will stop at Perambur also. 2) Ernakulam - Chennai Central – Ernakulam Weekly Superfast Specials: T.No.06345 Ernakulam - Chennai Central Weekly Superfast Special will leave Ernakulam at 17.00 hrs. o­n Thursdays from 11.4.2013 to 13.6.2013 and arrive Chennai Central at 05.15 hrs. the next day. T.No.06346 Chennai Central - Ernakulam Weekly Superfast Special will leave Chennai Central at 20.00 hrs. o­n Fridays from 12.4.2013 to 14.6.2013 and arrive Ernakulam at 08.00 hrs. the next day. 3) Coimbatore - Chennai Central – Coimbatore Weekly Superfast Specials: T.No.06616 Coimbatore - Chennai Central Weekly Superfast Special will leave Coimbatore at 23.55 hrs. o­n Tuesdays from 16.4.2013 to 18.6.2013 and arrive Chennai Central at 08.15 hrs. the next day. T.No.06615 Chennai Central – Coimbatore Weekly Superfast Special will leave Chennai Central at 21.00 hrs. o­n Wednesdays from 17.4.2013 to 19.6.2013 and arrive Coimbatore at 04.30 hrs. the next day. 4) Chennai Central – Tuticorin – Chennai Central Fortnightly Specials (via. Chennai Egmore, Vriddhachalam, Tiruchchirappalli): T.No.06007 Chennai Central – Tuticorin Fortnightly Special will leave Chennai Central at 19.30 hrs. o­n 18th April, 2nd, 16th, 30thMay and 13th June arrive Tuticorin at 10.00 hrs. the next day. T.No.06008 Tuticorin – Chennai Central Fortnightly Special will leave Tuticorin at 15.00 hrs. o­n 19thApril, 3rd, 17th, 31st May and 14thJune and arrive Chennai Central at 05.00 hrs. the next day. 5) Chennai Central – Rameswaram – Chennai Central Fortnightly Specials (via. Chennai Egmore, Vriddhachalam, Tiruchchirappalli, Karaikkudi): T.No.06009 Chennai Central – Rameswaram Fortnightly Special will leave Chennai Central at 19.30 hrs. o­n 25th April, 9th, 23rd May, 6thand 20th June and arrive Rameswaram at 08.45 hrs. the next day. T.No.06010 Rameswaram – Chennai Central Fortnightly Special will leave Rameswaram at 15.45 hrs. o­n 26th April, 10th, 24th May, 7th and 21st June and arrive Chennai Central at 05.00 hrs. the next day. 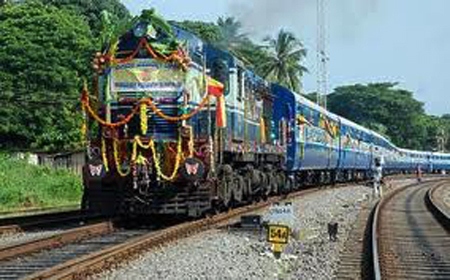 6) Tirunelveli – Chennai Central – Tirunelveli Weekly Specials (via. Tenkasi): T.No.06746 Tirunelveli – Chennai Central Weekly Special will leave Tirunelveli at 17.40 hrs. o­n Thursdays from 11.4.2013 to 13.6.2013 and arrive Chennai Central at 09.40 hrs. the next day. T.No.06745 Chennai Central – Tirunelveli Weekly Special will leave Chennai Central at 22.30 hrs. o­n Fridays from 12.4.2013 to 14.6.2013 and arrive Tirunelveli at 14.30 hrs. the next day. 7) Chennai Central – Tirunelveli – Chennai Central Weekly AC Specials:T.No. 06005 Chennai Central – Tirunelveli AC Weekly Special will leave Chennai Central at 22.30 hrs. o­n Sundays from 14.4.2013 to 05.5.2013 and arrive Tirunelveli at 12.45 hrs. the next day. T.No. 06006 Tirunelveli – Chennai Central AC Weekly Special will leave Tirunelveli at 15.00 hrs. o­n Mondays from 15.4.2013 to 06.5.2013 and arrive Chennai Central at 05.15 hrs. the next day. 8) Nagercoil – Chennai Egmore Weekly Superfast Special & Chennai Egmore – Nagercoil Weekly Special: T.No.06748 Nagercoil – Chennai Egmore Superfast Weekly Superfast Special will leave Nagercoil at 17.00 hrs. o­n Sundays from 7.4.2013 to 23.6.2013 and arrive Chennai Egmore at 06.05 hrs. the next day. T.No.06747 Chennai Egmore – Nagercoil Weekly Special will leave Chennai Egmore at 14.35 hrs. o­n Mondays from 8.4.2013 to 24.6.2013 and arrive Nagercoil at 05.30 hrs. the next day. 9) Chennai Central – Kochuveli Superfast AC Special (via. Coimbatore, Kottayam) & Kochuveli – Chennai Central Superfast AC Special (via. Thiruvananthapuram, Nagercoil Town, Tirunelveli, Madurai and Erode): T.No. 06011 Chennai Central – Kochuveli Superfast AC Special will leave Chennai Central at 21.00 hrs. o­n Fridays from 12.4.2013 to 14.6.2013 and arrive Kochuveli at 12.35 hrs. the next day. T.No.06012 Kochuveli – Chennai Central Superfast AC Special will leave Kochuveli at 20.05 hrs. o­n Saturdays from 13.4.2013 to 15.6.2013 and arrive Chennai Central at 12.35 hrs. the next day.